Touch the Menu button and choose the Set As command. If the Set As command doesn’t appear, you can’t use that image; not every album allows its images to be set as wallpaper. Choose Home Screen, Lock Screen, or Home and Lock Screens. When you choose the Home and Lock Screens command, you set both screen wallpapers at once. You may be prompted to choose an app before you crop. If so, choose the Gallery app, shown as Crop Picture. Then touch the Always button to always use that app. You’ll never be bothered with the prompt again! You need to crop the image to match the tablet’s frame. A guide appears when the tablet is oriented differently from the picture’s orientation, such as when cropping a horizontal image to match a vertical screen. The image is set as the wallpaper you selected. To see the wallpaper, touch the Home button or lock the tablet. You can use these steps to assign an image to a contact. In Step 3, choose Contact. 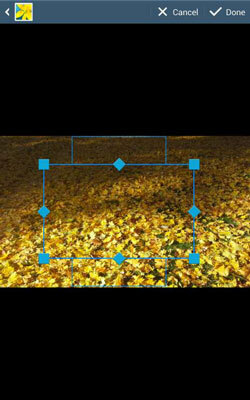 Then select the contact and crop the image. The Home and Lock screen wallpapers can be set also from the Home screen directly.